Winter here in the Midwest is always cold, but the past few months have been something even worse. Especially, unnecessarily, unexpectedly, brutally cold. I'm a warm weather fan to begin with, but this winter has brought that feeling to an entirely new level, as I'll do just about whatever I can to avoid going outside when the temperatures are below 0° day after day. Brrrrrrrr. But lately that hasn't been the only obstacle standing in my way. Because now not only do I want to stay indoors to avoid the arctic blast, but I know that in order to go somewhere I'll have to unwrap myself from the luxurious softness of the most plush blanket ever made, the Luster Loft Fleece Blanket from American Blanket Company. With the singular goal to design, cut, sew, package and ship the best blankets they can possibly make, American Blanket Company handcrafts only the highest quality fleece blankets that last a lifetime. 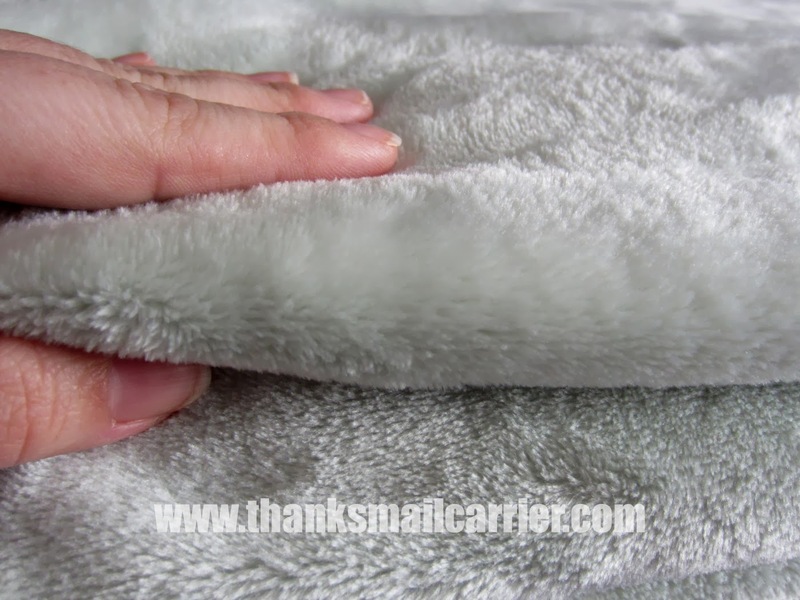 Whether you are shopping for a baby blanket, throw blanket, bedroom blanket or more, this company has the color and size you're looking for in the beautiful, luxurious quality you desire. 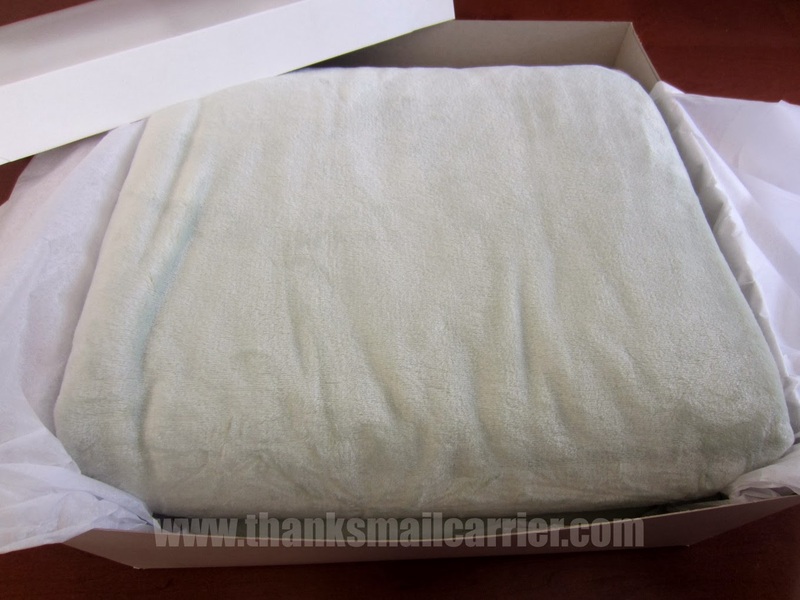 Being the somewhat skeptical person that I am, I was interested in seeing if American Blanket Company's Luster Loft Blanket would truly live up to their claim of it being the softest plush blanket ever made. I'm always a fan of companies that take the time to package and wrap their products well, as that not only means that they are immediately ready for gift-giving, but it it just gives a wonderful first impression. But the feeling of being dazzled didn't stop once I untied this silver bow. In fact, it was quite the opposite as I pulled back the box top and ran my hands over the softest blanket that I had ever felt. Available in nine different colors, I was instantly in love with the lightness of the Sea Mist Green (it is more green than it appears in photos) and the way that it would easily blend and complement in just about any room of the house. But the feel. The ultra-amazing softness. The incredibly sleek luster. Mmmmmmm. With just the right amount of silky smoothness, this blanket somehow manages to feel delicate yet extremely durable at the same time and essentially calls out to you to wrap yourself in its softness. Is it any wonder that every member of our household immediately had to have a turn enjoying its lavish plushness? Needless to say, I'm not the only one who has been in love with this Luster Loft Blanket since its arrival. Granted, my kids don't care that it is machine washable and is 100% guaranteed not to shed or pill like I do, they just know it feels exceptionally nice against their skin. With the temperatures showing no signs of improvement, this blanket has been the perfect thing to grab for a warmth and softness, whether cuddled up on the couch to watch a movie or laid across the bed for an extra layer. I have no doubt that it will be a favorite for many years to come! Available in Twin, Full/Queen and King/Cal. 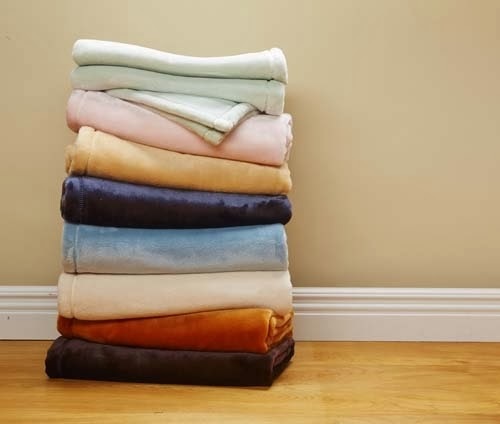 King size options, the Luster Loft Fleece Blanket retails for $59, $69 and $79, respectively, and would be a perfect addition to any household and an extremely wonderful gift. Considering that you can even add custom monogramming or embroidery for personalization, this blanket would truly make a luxurious wedding present that would actually get used, a better alternative than flowers for Mother's Day or the holidays or just a beautiful item to have around your home! No more cheap blankets that shed pieces, fall apart, have breaking seams or just feel like fuzzy cardboard when these are around! 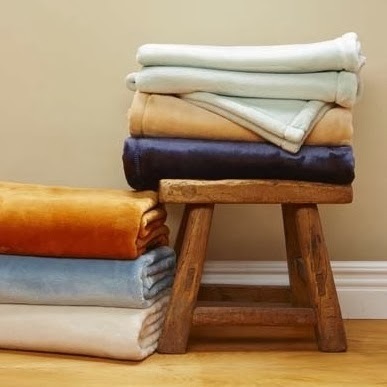 Find out more about American Blanket Company's philosophy, their small shop in Fall River, Massachusetts and their full line of products by visiting AmericanBlanketCompany.com and connecting with them on Facebook, Twitter and Pinterest. 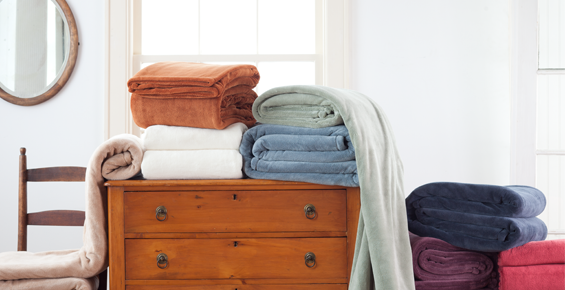 One lucky person will win their choice of size and color Luster Loft Fleece Blanket from American Blanket Company! 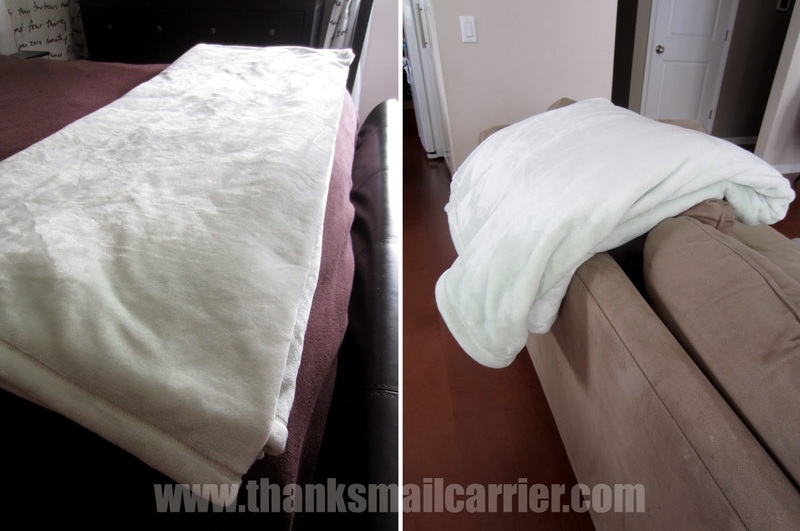 A big thank you to American Blanket Company for providing a Luster Loft Blanket for me to review as well as for one lucky giveaway winner. The opinions shared are my own and honest and if you really need to see more, click here to see how I roll. Buxton blue is my favorite color. I like the Patriot Blue. I like the Pale Pink! I like the color Golden dune. It looks warm and comfortable!! I love the chocolate color! I love the pale pink! So hard to choose! I like a lot of the choices, but I guess I'll have to say the Buxton Blue. I love the Buxton Blue! Sea Mist Green is so soft and pretty and matches my comforter and rug in my bedroom. Love the looks of this blanket. My favorite is the Sea Mist Green...lovely color! I love the chocolate one. I love the Patriot Blue, It is so pretty. Patriot Blue is my favorite! Sea Mist Green is my favorite! My favorite color is the Soft Beige. I like the Buxton Blue color! My favorite color is the sea mist green! My favorite is the Chocolate. i love the pale pink! My husband won't, but I don't care! BLUE!! I'd have to go with blue. It's always been my favorite color. The Golden Dune color makes me feel warm just looking at it! Visited and my favorite color is Buxton Blue. The chocolate is my favorite! My favorite color is Buxton Blue. I like Navajo White. Thanks. I just love the Patriot blue color the best!! I like the patriot blue color. I think I would pick the Chocolate one! My favorite is Patriot Blue. I am torn between the Chocolate and the Buxton Blue. We are Patriots fans so would HAVE to be the Patriot Blue! My favorite is the Sea Mist Green. The chocolate one....love it!!! Thank you for the chance to win, and to keep warm....lol. I'd love the pale pink! I like the chocolate color the best. My fave is the Patriot Blue. I like the sea mist green! I like the Buxton Blue the most. I like sea mist green. I really like the patriot blue colored blanket. So many choices! Of them all, I like the Patriot Blue color the best. All of the colors are pretty, but I really like the Navajo White. I really like Buxton Blue! The chocolate is my favorite color, although they are all beautiful. My favorite color blanket is Navajo White! I like the patriot blue. Darkest one to hide the stains I am sure the kids will make! Buxton Blue would be lovely in my bedroom. I would choose the pale pink blanket. It looks so soft. Chocolate is my favorite color. I love the Deep blue, their Patriot Blue! I could use a blanket like this, who wouldn't? My favorite color would be the soft beige. I love the chocolate color the best! I like the chocolate color. I like the Buxton Blue blanket. I love the chocolate brown. Looks so warm .....I want to be warm too ! I like the Patriot Blue or the chocolate blanket. My favorite color blanket is the Sea Mist Green. Thanks for the giveaway! My favorite color is the Gold Dune. I really like the Buxton Blue. I love the sea mist green color! I like the soft beige. My favorite color is Navajo White. I like the pale pink. I really like the chocolate blanket. I like the chocolate brown also! My favorite color is chocolate! I like the Boxum Blue but is so hard to choose. I like the Golden Dune as well. I think the golden dune would match my stuff the best. chocolate color Luster Loft Fleece Blanket is my favorite. My favorite Luster Loft Fleece Blanket color is the golden dune. I would like the Soft Beige Luster Loft Throw blanket. Patriot Blue is my favorite. I love teh chocolate color. Sea Mist Green would be my choice of color if I was to win this beautiful blanket. I would choose the patriot blue. This looks so cozy! My favorite is patriot blue. My favorite is the chocolate color. I like the chocolate color too. Buxton Blue is my favorite color and would look great on my bed. I think my favorite is Buxton Blue, but I also like Cotton Ball! My favorite color is Chocolate. I love the golden dune color. I really love the Patriot Blue color. Oh my goodness, these look so soft! My boyfriend has been searching for something like this! I would have to say Patriot blue. I like the Buxton Blue! I like the chocolate blanket. These look awesome! And the Golden Dune is the color I like best. TruMoo Introduces Chocolate Marshmallow Milk!